The DHC-1 Chipmunk is the first indigenous design from deHavilland Canada. It is an all-metal, low wing, single engine aircraft with a fixed landing gear and fabric-covered control surfaces. The wing is also fabric-covered aft of the spar. The DHC-1’s used in Canada has an awful looking bubble-canopy that I will NOT be modelling. 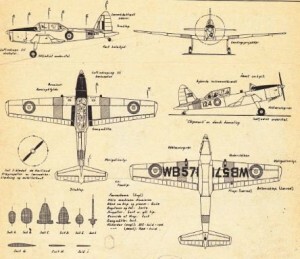 The aircraft was a huge success, with 1000’s being built. More than 500 are still flying today. 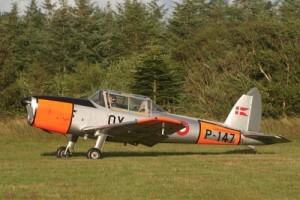 I have started on the development of a deHavilland Canada DHC-1 Chipmunk.Like all my plans, this one is in scale 1:5. This plane has turned out to be way easier than the SAAB T-17 Supporter. Here is a picture of the results so far. 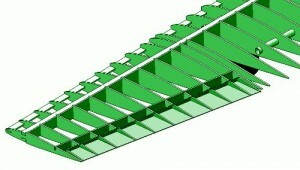 I am now doing the wing-fuselage attachment and the empenage. It’s been a while since I’ve worked on this plane. After adding the motor mount to the Messerschmitt Bf-108 Taifun, I thought I might just as well continue and make a motor mount for the DHC-1 Chipmunk. Like the Bf-108, the prop is quite high up in the cowl and I’m using the same construction method with a Dubro engine mount, placed upside down and by using an angled the firewall. 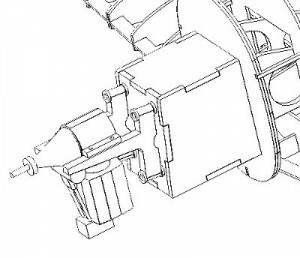 The motor mount box is using interlocking construction to distribute the thrust throughout the airframe. The engine is the OS FS91S II – my standard engine for a plane of this size. OK now, time to look at the wing attachment. The DHC-1 has two issues here. First, the landing gear is so damn far away from the plane center-line. The wingspan is a little over 2 meters, but the wheel distance is around 60 cm. If I leave the center wing section, with landing gear, on the fuselage, each detachable wing is only around 75 cm – a rather small wing section. The fuselage is about 1.6 meter long, so a single piece wing of 2.10 m is not really that much longer than the fuse itself. 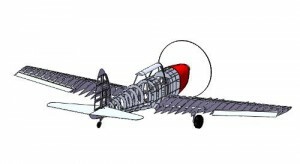 Secondly, the fuselage is not flat where the wings are attached. It looks like it’s due to the wing incidence. 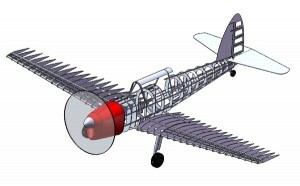 The wing/fuselage is flat at the main spar, but the leading edge is above, and the trailing edge is below the fuselage bottom. The “problem” is clearly visible in the attached photos. I’ll have to think about this problem for a bit. Decided to do something a bit easier – the rudder. This is of very standard construction with the exception that only two hinges were used – and only one was visible externally. I would prefer to use Robart hinge points, but I don’t think it’s possible to hide them. 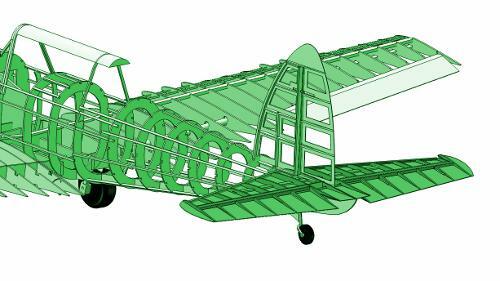 I will probably have to arrange the hinges on the model the same way as on the original plane. This is the latest update. As you can see, this plane is almost done. There are of course a lot of details to complete, but it definitely looks like a DHC-1 Chipmunk now. I have received new information about this aircraft. First of all, there is now a DHC-1 Chipmunk at my place of work, which makes life a lot easier. Secondly, I have received a “new” 3-view (the paper is old and yellow) that correctly shows the main wing and fairing. This should solve, once and for all, the problem I have about the wing-attachment under the fuselage. I didn’t get as far as I had planned this weekend. I spent an entire day fixing the rudder. The problem is the hinge. Most make the hinge using a pipe with a fixed diameter, but this rudder narrows towards the tip. This is very confusing, and I spent a lot of time looking at pictures and at how others have tackled this problem. There MUST be an easy way. I have started work on the ailerons. They look simple, but because of the taper of the wing, they turned out really complicated. They look tapered on the 3-views I have got, but they don’t look like that in real life. I am not done yet, but it is a start. I’ve got to finish the work on this aircraft really soon. I need to get so far that all the ply-wood parts can be cut. I have been cleaning up part of the rudder assembly today. There really isn’t much to see, so I will skip the picture for once. I finally got round to the elevators. It wasn’t as hard as I thought it would be. I am getting good at those bits. I hope I get good at doing fuselages soon, too. I didn’t get a whole lot done today, as I felt very exhausted. I did start to clean up the wing though. I also got the aileron tapered. The DHC-1 looks complete, but unfortunately there is still a long way to go. Landing gear and attachments in the wings. Mounting of servo and radio equipment. I guess I will need one full day of work for each of these.